scored. The quarter ended 28-4.
pointers in the quarter with Aaliyah scoring 7 points and CarolAnn 6. Monterey scoreless. The half ended 58-4.
scoreless again in the 4th quarter for the 78-11 win. points. Shalya also had a great game with 3 threes and 14 points. by 3 with about 3 minutes to go. Monetery soon took a 19-7 lead. to cut it to 19-13 at the end of the quarter. make it a 4 point game. free throws by Zach cut the Monterey lead to 31-26 at the half. Will tying the game at 40 all! The quarter ended 43-42 Monterey. 47-45. Zach then had another steal with Parker being fouled... 48-45.
but it wasn't called, and they scored...49-48 Wildcats. freethrows for a 59-51 win. else losing seniors, the future is very bright for the Bobcats. 13; Will 4, 1 three; JP Reagan 10, 2 threes; Remington 4. The Lady Bobcats had no trouble beating Gordonsville Friday night. Bobcats led 22-5 at the end of one quarter. quarter to take a 42-19 lead at the half. at the end of three. The Lady Bobcats outscored the Tigerettes 17-13 for the 80-48 win. Shayla 9; Jasimine Brown 2; bailey one 3.
year, and they outplayed the Tigers all night. Reagan had 6 points and Luke Smith a three to lead the Bobcats. their own in rebounds and just outplayed the Tigers. lead. The quarter ended 41-35.
fashioned way for a 53-46 lead. stretch with freethrows for the 58-52 win. Zach and one for JP; Parker 7; Will 4; Remi 2; Luke 5, 1 three. proudly wore during her four-year career as a PCHS Lady Bobcat. Region Most Valuable Player during her junior and senior years. leadership, Miss Pickett and PCHS Most Athletic. recognized by the TSSAA as Miss 2017-2018 Basketball in single A.
playing at Campbellsville University for the Lady Tigers. Lady Bobcats win 82-54 over Clinton Co.
19 points, so they are well on their way. the end of one quarter. 42-32. Aaliyah, Chloe, Abbi, and CarolAnn all had steals in the quarter. Shayla had blocked shots in the quarter which ended 65-38.
threes for 12; Shayla 6 with 1 three; CarolAnn 3; Jasimine Brown 3. Each year for the last five years in the Bobcats/Clinton Co.
Friday when the experienced Bulldog team beat the young Bobcats 72-39.
difference in the game though. John Parker Reagan tied the game followed by a Bulldog three. With Clinton Co. up 7-2, Will Amonett hit a three to cut it to 7-5.
closer, with the Bulldogs scoring 19 to the Bobcats' 14. Mark Smith 2; John Zachary 3; Caleb Lowhorn 1.
everyone, a win at home next season may be very likely. win. Aaliyah Brown had an outstanding game with 31 points, 1 three. 1st quarter 20-11 Pickett Co., 2nd-41-24, 3rd- 52-36, Game 80-51. 3 threes; Bailey 7, 1 three; Shayla 7, CarolAnn 8. 1st quarter 22-5 Pickett Co., 2nd-46-23, 3rd- 64-36, Game 77-48. Richland, 4th 63 all, OT Richland 73-70. 3rd-32-26 Community, game 47-42 Community. 16; Luke Smith 2; JP Reagan 10; Remington 8. Parker 12, Luke Smith had a great game with 15; Slayde 2; Remington 11.
they are ranked #3 with the AP Poll coming out on the 15th. Abbi Bilbrey scored first with the Tigerettes tying the game. ball with Abbi scoring. Ahead 10-3, Kyndal drained a three pointer. with Chloe Burton going in for an impressive layup. for a 24-6 Pickett Co. lead. had a steal. The half ended 44-17.
a three for 3; Carol Ann Stockton 2; Bailey Evans 2.
won a district contest over the Bobcats 63-52.
several steals and as usual, and played great D with several steals. The half ended with the Tigers on top 25-18. The Bobcats fought back with Zach's basket cutting it to 33-28. Both teams missed shots before a free throw by Zach cut it to 33-29. Again the Tigers pulled away with the 3rd quarter ending 39-31.
with 13, 1 three; Will had 11 with 3 threes; Parker 7; Luke 5, 1 three. Co. 0-15, 0-5; Monterey 0-16, 0-5. 15-4, 3-2; Clarkrange 9-9, 2-3; Trousdale Co. 6-11, 2-3; Pickett Co.
9-8, 1-4; Jackson Co. 7-11, 1-4.
overcame that and a Livingston comeback for the win. Abbi and two steals by Aaliyah. stealing the ball and scoring with the quarter ending 12-2. 40-39 at the end of three. a missed jump ball call, Livingston was called for an over and back. 44-42. LA tied the game. Aaliyah hit two more freethrows. LA beat 8A favorite Upperman by 16.
the Bobcats cut it to just 13-11. The first quarter ended 15-11.
a 9 point game. But by the half the Wildcats were ahead 32-19.
route to a 48-39 lead at the end of three. The final quarter began with an LA walk not called and a score. Springs Tuesday night at home. RBS was picked for 2nd place. ball and either smack it or steal it when she tries to pass the ball. Against Oneida Friday night, it was 6-0 Clarkrange within 10 seconds. In 6A boys' action, favorite Clay Co. is 5-1 winning 5 in a row. was to York 60-49, after York took a 20-2 lead to start the game. Westmoreland and losing to Livingston, Watertown and Cookeville. reported. The teams they beat are 2-10.
teams have an 8-5 record. a surprisingly close game against 2-3 Oneida, 56-48. 58-53. Much improved Trousdale Co. is 3-2. Bobcats their 11-6 lead at the end of the 1st quarter. is a talented team with a lot of potential. being 65-41. The Bobcats are now 5-0. Reagan 1; Lowhorn 9; W. Amonett 2 and B. Zachary 3.
they caught fire in the second half outscoring the Lady Tigers 47-11! gotten into foul trouble so she sat out much of the first half. Bobcats a 57-32 lead at the end of 3. They outscored Sunbright 25-4.
also scored on a three pointer, and Shayla Wood stole the ball. threes; Elly Smith 12, 1 three; Jasimine Brown 2. Bobcats on Monday and another game against Northview Academy on Tuesday. and in the final 13-6.
second half but the Bobcats held on for the 56-54 win. points at 40-35 at the half. pulled away for a 60-48 lead at the end of three quarters. points, with an impressive game as well. 26-15 lead at the half. outscoring DeKalb Co 16-15 for the 52-49 win. being the leading scorer with 11.
of the quarter which put the Bobcats on top. was the score at the end of three. and grabbed a couple of rebounds to help the Bobcat cause. White was close behind with 16 points. Gore 10; Caleb Lowhorn 6; Mark Smith 2.
with our Lady Bobcats easily beating them by a score of 72-46.
the time our girls were ahead 12-2 the OS coach called a time out. a three, followed by a three pointer by Chloe Burton. again. The half ended 41-18.
coast for an impressive layup with defenders all around her. with 4. She was leading scorer with 20, with Abbi adding 17. Bailey Evans 1 three; Carol Ann Stockton 5, Jasmine Brown 2.
last year. The coaches voted them #1 in the preseason poll. Abbi will be two of the top players in the district, and in the state. The rest of the district will be fighting for that 4th region spot. they played their more talented freshmen the latter part of the season. as they gain experience as a team. the schedule for upcoming games and times. will be one of the top teams once again. group can not be counted out having an impact in the district. player, Remington White, unable to play last year due to an injury. returning along with a talented squad. Bryce Dicken #58, Brandon Smith #4. Smith, Alix Driver, Tyra Johnson, Kenzie Zachary. 2, Mark Smith 2 and a int. for TD. Hardy Memorial made the region tournament. that who did it was unclear! the fact that there are only 4 other players available off the bench. be a halftime scoring record. also making another basket, while Kyndal had 6 points, and Chloe 5.
pointer, Savannah scored, as did Aaliyah. stars to score the 100th pointsunk. County is currently #4 in the state. threes; Kyndal 10; Chloe 13 and Bailey a three. Pittsburg missed a three, Brian grabbed the rebound and Trent scored. the Bobcats had a 34-7 lead. several rebounds. Brian had 4 threes and 16 points in the half. Pirate shot and didn't play any more of the game. Brian Gibson led the team in scoring with 22 points and 5 threes. and a three; Bryson 14; Luke a three; Cole Sells 2 and Slade Copeland 2.
of Tennessee Miss Basketball in Class A.
MTSU on Tuesday, March 6 at 7:00 p.m.
basketball coaches and members of the media nominated the finalists. been presented to Tennessee’s best high school basketball players. championship game as part of the post-game trophy ceremony. most of the 3rd and 4th quarters with some of the starters helping out. Gracie, Savannah, Aaliyah and Chloe all had steals in the game. three and Bailey 2 points. Parker Gore scored. After Monterey scored Trent Young cut it to 1.
throws and the quarter ended 11-9 Bobcats. on their home court would be tough. time out they responded with a three...15-12.
but they were still ahead 25-23 at the half. Parker Reagan 2 and Bryson Yorke 2.
listed for scoring 20 points in that same game. Thursday, Feb. 8th in a make up game. It will also be Senior Night. Come out and support the teams in their final regular season games. outstanding 4-year careers at Pickett County. came into the game early. Bobcats’ 87-67 win over Gordonsville. Bobcats came right back and tied the game on 2 free throws by Dawson. pass ended with Clay scoring making it 30-23 Bobcats. large turnout of Bobcat fans. basket to score. The half ended 44-31.
scoring night. Finally the Tiger starters went out, with ours to follow. Parker Reagan 4, Slayde Copeland 1, Clay Smith 4 and Bryson Yorke 2.
as part of a 5-game afternoon. then had a couple of turnovers which helped Green Co. go ahead 12-7.
the Lady Bobcats would dominate play. Courtney and by the end of three it was 59-40. Bailey Evans sinking a three for an impressive 82-53 Lady Bobcat win. Chloe 7 with 2 threes, and Bailey one 3. County, a team the Bobcats could face in the upcoming tournaments. ended with the Kentucky team ahead 21-14.
of the game on Bryson Yorke's score. three. At the half it was 35 all. a missed Clay Co. shot, Dawson's three tied the game. score and the Bobcats led 52-48 at the end of three quarters. scorer. Also, Parker Gore 4 and Bryson Yorke 2. Brian was selected as the"Player of the Game." Congratulations to Brian on this well deserved award. Region Tournament champions, just like last year. Pritchett passed to Savannah Hammock who drove in to score. the ball but then the Lady Bobcats made their first turnover. over again, and fouled Clarkrange. They sank both for a 5-2 lead. called and they then scored...7-4.
three did hit the target and the Lady Bobcats led by a point. out in the quarter, Aaliyah scored to make it a one point game at 14-13. Rogers called a time out. lead. Abbi Bilbrey then blocked a Lady Buffalo shot with Pickett Co.
after gaining possession, and carried the ball, nothing was called. By now the PC crowd was more than frustrated with the officiating. went ahead 28-25 and the half came to an end. Lady Bobcats then missed two free throws. girls turned the ball over and Clarkrange went up by 7 on a three. Clarkrange dropped in a three pointer and extended their lead to 43-31.
the ball and scored. Clarkrange's Charity Crabtree then fouled out. Savannah was absolutely clobbered without a foul being called. with a minute to go. Abbi scored making it a one point game at 58-57.
threw the ball out of bounds on the inbounds and fouled Clarkrange. dearly, for most of the game the Lady Bobcats outplayed Clarkrange. both the district and region tournaments. 1 three; Gracie 4; Aaliyah 15; Abbi 10; Chloe 2.
up by 3 with his three pointer. Again Clarkrange scored on a three. was off and Dawson scored...11-6.
made it 33-25, which was the score at the half. Parker scored first in the 3rd quarter followed by a Buffalo 3.
open three was off and the Bobcats began running down the clock. missed a three and fouled the Bobcats, but both shots were off. straight district game and 9th game in 10 games 58-53. Brian 20, 1 three; Trent 6, 2 threes; Parker 6; John Parker 5, 1 three. then tied the ball up with Courtney then scored. After a Clay Co.
33-18 at the half. Aaliyah also had another three in the quarter. by 22 at the end of three...55-33 and had no turnovers in the quarter. free throws. The final score was 70-52.
with 2 threes; Abbi scored 11.
home Friday night which put them alone in 2nd place in the district. a three and the half ended 40-27. Bobcat lead. Clay Co turned the ball over and fouled Dawson...61-54.
added a free throw...65-57. Clay Co. sank 2 free throws...65-59. Bulldogs out of a tie with the Bobcats for 2nd place. 7-3, Clay 6-4, Jackson Co. 5-5, Clarkrange 5-6, RBS & Trousdale Co.
and 1 three; Brian 8; Clay 6 and Bryson 2.
along with the Lady Panthers for the big win. It didn't take long for the Lady Bobcats to pull away again. made a couple of threes and the Lady Bobcats having trouble scoring. 79-69, giving the Lady Bobcats their most impressive win of the year. performance he has been getting out of our girls for many years! important factor in keeping the Pickett County tradition going strong. and a three, Aaliyah 20 and 3 threes, Savannah 11, 1 three, Abbi 8.
had three players scoring 20 points in the same game. Saturday night at Stone Memorial for the first half. too much of a lead to make up. 37-14 and they just didn't look like the team we know. more than half the game due to the rout. then Courtney which put them up 12-2 with Courtney's three pointer. quarter by also sinking a three pointer. Jackson County's next possession she blocked their next shot as well. it 38-14, and she soon stole the ball again. By the half it was 41-21.
and Aaliyah who also raced to the other end of the court to score. score at the buzzer in an amazing shot! The quarter ended 69-37.
shortly adding another 3 pointer. straight over the Lady Blue Devils. 13, 1 three. Gracie 7, 2 threes. Savannah 12, 2 threes. Abbi 12. Bobcat basket came on a Trent Young drive to the basket to score. from the crowd and cut it to 6-4.
and sinking threes and suddenly it was 25-25. A Clay Smith basket put the Bobcats back on top but Jackson Co.
and swished another 3 pointer to give the Cats a 32-31 lead at the half. edged ahead 37-33. But the Blue Devils cut it to 1 with another 3.
first shot. The Bobcats got the ball but didn't score. Jackson Co.
missed their shot and Brian scored to put the Bobcats up 57-55.
stole the ball and scored to tie the game again. Now the Bobcats had the ball with just under 40 seconds to go. games, huddled. They then put one second back on the clock. earlier loss at Jackson County. This will be Homecoming 2018.
loss, while the boys have moved up into third place at 4-3.
scoring opportunities as well. But, Abbi did have an outstanding game. Courtney 1 and Gracie Martin 1. The score at the end of 1 was 23-7.
called for a charge and Chloe Burton coolly hit an all-net three. and had 3 steals. Aaliyah had 9 points with 3 steals as well. all had steals in the quarter which ended 49-20.
playing time even if it is just about half the game. their 6th in a row and moving up in the standings. Coach Amonett, which won the game. possessions before Brian's 3 pointer put the Bobcats on top 8-6.
scored as time ran out for a 16-12 Bobcat lead at the end of one. their last of the game. has got to be one of the favorites for Freshman of the Year! point lead. Another Bobcat steal with Dawson scoring made it 33-27.
points and the 3rd quarter ended 54-50.
the big win. With the win the Bobcats went to 11-4 on the season. teams traded possessions before Dawson Abbott's three made it 6-0.
sinking another 3 for a 14-2 lead. a leading candidate for district MVP. pattern as the first quarter with the Bobcats dominating play. it 31-10, but it was a team effort that made the team so dominate. the basket. The half ended 39-21. The 3rd quarter began with John Parker driving in to score. Dawson led the team in scoring with 32 points including 8 threes. competition, although RBS will be no pushover. these, with Jackson County, Stone Memorial, Clarkrange and Clay County. their program, it was a chance for the younger Lady Bobcats to shine. County in the final quarter keeping them scoreless for a final of 95-12.
for the 4th straight year one of the best single A teams in the state. Bobcats stealing the ball over and over, scoring and blocking shots. points to lead the Lady Bobcats while playing only about half the game. before last night's game with district #1 Monterey. biggest advantage at 17 points when the score was 55-38. Reagan 9 and Luke Smith 2.
the season. The Bobcats dominated the Tigers by a score of 83 to 46.
quarter ended with the Bobcats on top 22-10.
l-o-o-o-n-g three pointer for a 51-23 lead. into the game to finish the quarter and to play the final quarter. talent played well helping the Bobcats to win 83-46.
the Richland Christmas Classic December 28th and 29th. with a close score of 72-70. 90-17 with Lady Bobcats bringing home another win. score of 65-61 with Dawson Abbott scoring 32 points. with 21 points which were all scored in the first half. stretch helped them to a 35-17 lead at the half. way to a 52-22 lad after 3 quarters. starters throughout the 4th quarter in route to the 64-37 win. way to a 76-70 win over Livingston Academy. stole the ball, but the quarter ended all knotted up. make it a 2 point game. When they next hit a three, they had regained the lead at 39-38.
it to 44-43 with the half ending 45-43.
lead with the final score being 76-70.
double figures, scoring 18. Also: Parker Gore 2, Bryson Yorke 2. Threes: Dawson 6, Brian 3, Trent 1. High School in Lynnville, TN. They play at 1 p.m. and 3:30 both days. last at 0-13 and 0-4.
their January 23 game at Clarkrange. tied for 1st at 8-3, 4-0. Co. and Red Boiling Springs at home, and away vs. Clarkrange. are introduced, which has to be unnerving for the visiting team. The first scores of the 2nd quarter were two free throws by Abbi. another three for a 33-6 score. up with 13 points at the half with the Lady Bobcats having 40.
period of 25 seconds. Keisling Insurance is sponsoring this event. 56-22. Both she and Gracie had steals before the quarter ended 56-26. Lady Bobcats 5th straight blowout win 74-30. 44-31 lead at the half. was then another three pointer for Wayne County. fouled...hard. He made one of two and the quarter ended 22-16. Cards scored 5 straight to go up 33-22.
of the game for that 44-31 halftime lead. large number of Wayne County fans left at the half. and Brian made it a 6 point game and by now the crowd was very loud. But the Cards went back up by 10. Another Dawson three made it 55-48. Wayne Co. had the ball to start the final quarter and scored. had a turnover. With 1:32 to go Coach Amonett had Dawson foul, twice. seconds to go Trent nearly stole the ball and was called for a foul. Again the Cards missed the front end of a one and one. game, especially down the stretch! Bobcats on top 12-10 and they would be ahead 15-14 after one quarter. free throws for a 26-20 lead. The Wildcats fell behind by 8 before a three pointer cut it to 32-27. Pickett County 42 LA 34. Bobcat lead and the Bobcats began to have trouble advancing the ball. pointer and the Bobcats pulled away again for the 83-66 win. 1st quarter the Lady Bobcats had a commanding 21-10 lead. stretching the lead to 39-19 at the half. end of the 1st quarter it was a 19-9 Lady Bobcat lead. contributed to their 41-23 lead at the half. dropped one in the 4th quarter with the Lady Bobcats winning 74-50. Courtney led in scoring with 19 points. Bennett in the Stone Memorial Thanksgiving Classic. last night's game with Wayne County, Kentucky. did, but in the end it was the Bobcats pulling away for the 63-44 win. throw, and live music from the Cross Brothers Band with Jimmy Rigney. who donated a monetary donation. support for our players and coaches. One of the best basketball seasons ever for Pickett County is now over but next season looks to be just as promising. trip to the state tournament and super individual performances by each Lady Bobcat, gave the loyal Lady Bobcat fans another season to remember. rebounds and many key baskets will be equally missed. But, this is always a part of high school basketball and their contributions will long be remembered! Thank you Abbi and Kassidy! it all. Many fans, and most Lady Bobcat fans, believe that they may have been the best team this year, and if not for a slow first half against the eventual champion South Greene at the state tournament, would have been state champions this year. They certainly outplayed the Lady Rebels in the 2nd half and outscored them 38-31. Tournament MVP and region Tournament MVP, and could be a Miss Basketball candidate next year. 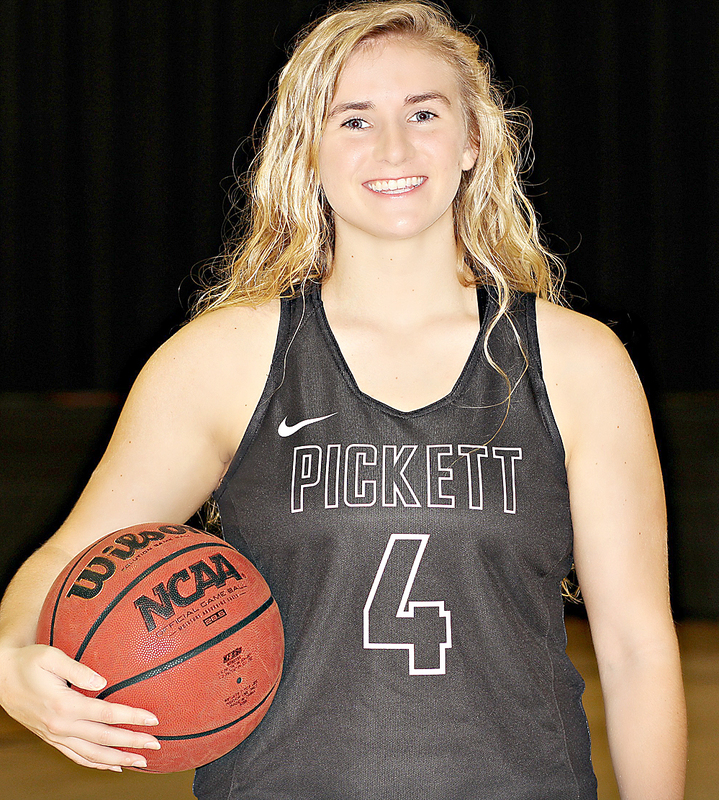 Gracie Martin, district defensive player of the year, who could be counted on to score 3’s and key baskets as well, will also be a top player again. Savannah Hammock, who also was on all tournament teams, was a key rebounder, often was high scorer and was also a great defensive player. Sophomore Aaliyah Brown returns and while she wasn’t a starter, played extensive time in each game and often was top scorer including her impressive 23 points at the state tournament. She will also be one of the best in the district next year. starters and to protect Lady Bobcat leads. They usually saw playing time against opponents starters and played evenly with them if not better! some of these freshmen were on the National Championship 7th Grade AAU team. Gone will be South Greene to AA, along with many private schools who will move to Division II, Watertown to AA, Marion County to AA. Next year will see an easier region group. But, the Sub-State will no longer be easy as it has been vs. Chattanooga’s weak team. The teams who may be in the region from the other district: District 5: Ivy Academy (Soddy-Daisy, TN), Richard Hardy Memorial School (South Pittsburg, TN), South Pittsburg High School (South Pittsburg, TN), Van Buren Co. High School (Spencer, TN) and Whitwell High School (Whitwell, TN). None are expected to be up to 7A strength next year. (Hendersonville, TN), Republic High School (Nashville, TN), STEM Prep Academy (Nashville, TN) District 8: Cascade High School (Wartrace, TN), Cornersville High School (Cornersville, TN), Eagleville High School (Eagleville, TN), Fayetteville High School (Fayetteville, TN), Huntland High School (Huntland, TN), Moore Co. High School (Lynchburg, TN). Only Huntland and Morre County are expected to be strong, but both were top 10 teams this year. The Lady Bobcats should be the pick to win the district, the tournaments and head back to the state for the 4th straight year! And of course our Coach Brent Smith is a key to our girls’ success. He was Coach of the Year for the 4th straight time and led the Lady Bobcats to their third straight state tournament! The Bobcats also had a great season unexpectedly going to the Sub-State, coming in 2nd in the district regular season, and 2nd in the district and region tournaments. bench often to grab key rebounds, made important steals and key baskets and will be missed. Thank you Jake for your contributions. pointers always bring a roar from the Bobcat fans, but he also has many rebounds a game plus steals. Brian Gibson will again be a key with his rebounding, blocked shots and his scoring will be a key next season. Very impressive was Bryson Yorke who saw little playing time a year ago but started this year and was an all tournament pick in the playoffs. With a year’s experience under his belt, there is no telling how great his season will be next year. Clay Smith saw many starts and his 3-point shooting and steals were an important part of Bobcat play. Another outstanding season was Trent Young’s, now a starter, with his ball handling, 3 pointers and defensive play helping the Bobcats to their big season. Talented freshman Parker Gore showed a great deal of potential and will only be an even stronger player next year. The talented bench included Will Garrett, Evan Caudle, Luke Smith and Cole Sells, all played an important role in this year’s success and can look forward to increased playing time next year. Impressive was Coach Amonett’s season leading the Bobcats to a second place finish in the district, district and region tournaments and to the first Pickett County boys’ Sub-State since 2007 against CSAS. The Bobcats should be the pick to win the district next year and battle it out with Monterey and Van Buren County for the region title. Another Sub-State game and possible state tournament ticket are very good possibilities as well! For the third straight year the Lady Bobcats drew the team in the first round that would go on to win the state championship. The year before last they led Middleton almost to the last minute before Middleton pulled away and two games later were state champs. Last year it was South Greene which the Lady Bobcats drew first, PC fell behind, made a run but fell short and S. Greene won it all. This year it was South Greene up first and they had to fight off the Lady Bobcats in the second half to hold on for the win, 67-62. They beat Clarkrange, who only had to beat a 18-15 Perry County, a 22-13 Hampton team which only scored 27 points against Clarkrange, for the championship by the score of 66-57 against the Lady Buffaloes. Bobcats did the opposite, falling behind in the 1st half, and coming back to within 2 late in the game. The Glass House had a huge turnout of loud Lady Bobcats fans with South Greene also having a great turnout. back on a foul. S. Greene scored but Pickett Co. came right back with Abbi Buck scoring. S. Greene then hit a 3…7-4. Again Courtney scored and S. Greene turned the ball over. Another PC foul gave the ball back to the Lady Rebels and they scored to go ahead 9-6. A Lady Bobcat three was off with S. Greene then scoring to go up 11-6. At that point Aaliyah Brown came into the game and immediately drove to the basket to score, bringing loud cheers from the huge Lady Bobcat crowd. Both teams turned the ball over before Aaliyah again drove in and cut the score to 11-10. After a missed S. Greene shot, the Lady Bobcats were called for a walk and S. Greene scored. A Lady Bobcat shot was off, then a Lady Rebel walk wasn’t called and they scored and hit a free throw to go up 16-10. Aaliyah was then fouled in the act of shooting and her shots cut it to 16-13 after one quarter. S. Greene then went ahead 18-13, Pickett Co. walked and S. Greene scored. Coach Smith called a time out and the girls responded. Aaliyah scored, S. Greene missed with Aaliyah going to the free throw line and sank both…20-17. She then stole the ball and scored, 20-19 and the Lady Bobcat fans were roaring! S. Greene went up 23-20. It then appeared that Gracie Martin was fouled but they called it on our girls and S. Greene took advantage of that call and hit a three…26-19. Gracie was fouled a minute later and cut it to 26-20 but S. Greene then scored…28-20. A bad pass gave the ball back to the Lady Rebels and they went ahead 30-20. Then another turnover gave the Lady Rebels another score and it was 32-20 and things looked bleak. But our Lady Bobcats fought back. Aaliyah drove to the basket and scored. S. Greene hit two free throws and then Gracie sank two for the Lady Bobcats. The half ended with S. Greene going back to the line for 2 more points and at halftime it was 36-24.
but S. Greene responded with a 3 for their biggest lead at 39-26. Aaliyah then scored. After S. Greene fouled, Kassidy scored…39-30. S. Greene missed a shot and it was Courtney scoring. When the Lady Rebels missed a shot, it looked alike the comeback would continue as the Lady Bobcats raced down the court but a layup was off and our girls were called for a foul. But, S. Greene didn’t score and Abbi was fouled…2 free throws made it 39-34. The Lady Rebels scored an old fashioned 3, then got the ball back and scored to go up 46-34. Gracie then scored and added a free throw. S. Greene scored then soon after were fouled and hit one of two free throws…49-37. Down by 12, Gracie hit a three…49-40. The Lady Rebels hit one of two free throws…50-40. Gracie then dropped in another three pointer…50-43. Then a terrible call on Savannah Hammock gave S. Greene two free throws…52-43. Courtney drove in to score…52-45. Savannah then had a huge steal with Gracie scoring…52-47 and with seconds to go a Lady Bobcat three was off at the buzzer. They had outscored the Lady Rebels 23-16 in the quarter. 63-58. It was then Savannah leaving the game on her 5th foul and the score was then 64-56. Courtney was fouled and sank both shots making it 64-60 with 25.9 seconds to go. The Lady Rebels went to the free throw line…65-60. Aaliyah then drove in to score 67-62 but South Greene scored as time ran out escaping with a 67-62 win. Had there been a few more minutes in the comeback, the Lady Bobcats may have advanced. Pritchett 8 rebounds and 12 points, Abbi Buck 2 rebounds, 1 three and 7 points, Gracie Martin 5 rebounds, 2 threes, 1 steal and 18 points, Savannah Hammock 5 rebounds, 1 steal and 2 points, Elly Smith 1 rebound. Bobcats, who then came back to outplay the Lady Rebels in the 2nd half. game of the tournament, none of the deserving very Lady Bobcats made the All Tournament team. South Greene’s talented Taylor Lamb was named Tournament MVP. South Greene moves up to AA next year with the Lady Bobcats the pick to win it all next year. tournament results next week and Lady Bobcat/ Bobcat season wrap up next week. 7A again showed that this is the toughest district in the state. tournament and state with an outstanding 30-3 record. And Courtney was District MVP and Region MVP up against the eventual Miss Basketball. Both she and Aaliyah established themselves as potential Miss Basketball nominees next year, if not next year for Aaliyah, the year after! Back to the ‘Boro!!! We can beat South Greene! is against the defending state champions, the Lady Bobcats can win this game. How we can win:The Lady Bobcats didn’t play their best game last year in their matchup, got down by 12 but when they got back to playing Lady Bobcats basketball cut it to 3 points and nearly cut it to 1. If they play great basketball from the start, they can win. Cloudland, Hampton and Granger so they can and have been beaten.South Greene may come in overlooking the Lady Bobcats after their win last year. scoring power with the emergence of Aaliyah Brown and Savannah Hammock, added to last year’s top scorer Courtney Pritchett and school record three point shooter Abbi Buck. Gracie Martin was the defensive player of the year and Kassidy can score and gets plenty of rebounds. The Lady Bobcats were great last year and are great again this year! Greene! Going in knowing they can win, focusing on what they do best, playing their great defense all can add up to a win! The loyal Lady Bobcat fans packed the gym early Saturday night for the Lady Bobcats’ Sub-State game against the Lady Eagles of Van Buren County, the team they beat two years ago in the Sub-State away, 95-65. It was no contest again as the Lady Bobcats crushed the 15-17 Lady Eagles. It was 7-0 Lady Bobcats with Abbi scoring 5, one score was a three. Kassidy scored the first basket. VB scored. Abbi stole the ball with Courtney scoring…11-2. Aaliyah had a steal, Courtney too and it was 18-7 after one quarter. As the Lady Bobcats pulled away, Savannah had 2 threes, Aaliyah another and it was 31-14. Abbi had a steal with Aaliyah scoring…36-14. With the score 38-14 Savannah blocked a shot and the half ended 38-15. Van Buren brought a good sized crowd and they were enthusiastic in support of their team, but 80% of the gym was Lady Bobcat fans, and they were loud! Abbi started the 3rd quarter with a three, Savannah had another blocked shot, Aaliyah scored quite a few as the Lady Bobcats took a commanding lead of 65-26 after three quarters. Burton and Elly Smith scoring on free throws for a 77-40 final. Abbi 10, 2 threes, Gracie 5, Savannah 14, 2 threes, Haley 1, Elly 3. The win sends the Lady Bobcats to their third state tournament! The Lady Bobcats won their second straight Region Championship by beating Clarkrange 60-56 last week at Watertown. And once again our Courtney Pritchett was named MVP. Savannah Hammock scored first but Clarkrange came right back with a three. They then went up 5-2. But Kassidy Geesling scored before they fell behind 7-4. Courtney was fouled and made it 7-6. Again Clarkrange scored. Courtney cut it to 1 at 9-8. Again they went ahead 11-8, while their fouls weren’t called. A long pass to and score by Savannah made it 11-10. Clarkrange missed 3 straight shots and then fouled Courtney…12-11 Lady Bobcats. Clarkrange scored and Courtney went back to the free throw line…14-13. Clarkrange scored, we missed a three and they scored again…17-14 which was the score at the end of the quarter. but a Clarkrange player knocked down a Lady Bobcat yet the call was on her…no charge 19-15. Kassidy then scored, again no charge and it was 21-17. Abbi then hit a three to cut it to 1. They then took the lead on a Courtney Pritchett shot. No 3 seconds called…23-22 Clarkrange. Courtney drove to the basket and scored 24-23. Lady Buffaloes walked with Courtney scoring again…26-23. Then 26-25. Savannah’s score made it 28-25. Buffalo turnover and Aaliyah hit a three…31-25 and that was the halftime score. The Lady Bobcats were given a standing ovation by the huge crowd of Lady Bobcat fans. Surprisingly, Lady Buffalo fans only filled 2/3 of their side of the gym. turned the ball over on a missed three and a Clarkrange charge. Kassidy then scored…33-27. A Clarkrange walk led to Courtney driving in to score…35-27 and the fans were on their feet again! Courtney then stole the ball with Gracie Martin driving in to score…37-29. Another ‘range turnover and another Savannah score…39-29. Ten 39-31, 39-33, with Kassidy then scoring 41-33. Gracie stole the ball with Savannah scoring…43-33. We got the ball back and Savannah scored and hit a free throw…46-35. Clarkrange 3 point air ball. Courtney was fouled and the quarter ended 48-35 Lady Bobcats and it looked like Clarkrange was going on the road for the Sub-State. 48-39. The Lady Bobcats were slowing down the game but a foul gave the ball back to Clarkrange and they scored. Courtney was fouled…50-41. Clarkrange hit a three…50-44. A bad pass gave the ball to Clarkrange but they turned it over. PC was called for a carry and Clarkrange scored 50-46. We missed a shot and Clarkrange walked, no call and hit a three…50-49. Courtney drove in and hooked in a shot…52-49. Clarkrange hit 2 free throws, one point game. Courtney fouled…54-51. Clarkrange fouled…54-53 with 1:39 to go. Courtney added another 2 free throws and Gracie stole the ball and PC was fouled…but the shots were off. Clarkrange missed a 3. Savannah was fouled and sank both free throws…60-53. Clarkrange then hit a long three at the buzzer to lose 60-56. MVP Courtney Pritchett scored 26 while Kara Meadows scored an amazing 45 but that was not enough to beat our Lady Bobcats! Named to the Region All Tournament Team were: Aaliyah Brown, Savannah Hammock, Abbi Buck and Courtney Pritchett was MVP! A huge turnout of Bobcat fans, who were the loudest heard in many years, packed into the too small Van Buren gym Monday night to face the Eagles who were trying to advance to the state tournament for the 3rd straight year. Over 100 fans lined either end of the court, while others sat in the aisles. violation and Bryson Yorke put the Bobcats up 2-0. The ‘Cats pressed but Van Buren raced down court and began hitting uncontested threes and were ahead 22-9 after one quarter. This was a “let them play” game with few fouls called…at least on Van Buren. Even with Van Buren holding a large lead, the Bobcat fans and cheerleaders were LOUD and supportive. At 31-19 late in the 2nd quarter, things looked bleak for the Bobcats until Dawson Abbott hit two threes in half a minute to pull the Bobcats back to within 31-25 at the half. While the Eagle fans were quiet, the Bobcats fans roared as the ‘Cats left the court. quarter. The Bobcats were hurt by about 10 turnovers. three, the Bobcats turned the ball over and Van Buren hit yet another three for a 39-27 lead. The Eagle threes continued as did the Bobcat turnovers and by the end of 3 it was 51-38. Goodpasture, #3 Clay County and #5 Watertown between them and the region final, plus a good Monterey team to beat. But everything fell into the Bobcats’ favor, along with the outstanding coaching of Coach Amonett, to reach the Sub-State for the first time in 10 years. This was a very good Van Buren team playing their best basketball of the year. The Bobcats and fans should be very proud of the team’s outstanding year and with everyone back but Jake Smith, who played well in last night’s game, the future is very bright for the Bobcats. Junior and first year starter Bryson Yorke had an outstanding game with 17 points. Dawson Abbott 8, 2 threes. Trent Young 4. The final was 71-44 with Van Buren sinking 13 threes. Parker Gore 2, Brian Gibson 10, Clay Smith 1 three. Congratulations Coach Amonett, the Bobcats and fans …the best in the Upper Cumberland, on an outstanding 20-13 season! state ranked Clay County and led until late in the 3rd quarter! Parker Gore scored first followed by a Brian Gibson three. turned the ball over before Dawson was fouled…9-6. Clay hit a three. But Dawson matched it…12-9. Clay scored. Trent Young hit a three at the buzzer for a 15-11 score at the end of one! The Bobcats fans were on their feet! Clay came back 15-14. Then both teams had several turnovers with Bryson Yorke (2) Clay Smith having steals. Then Dawson hit a three…18-14. 18-16. A Clay Smith 3…21-16! Ask any fan at the game and this was one of the worst officiated games in memory. Clay was finally called for a walk and Dawson hit a three for a 24-16 halftime lead! quarter. Dawson scored…26-23. Clay County then grabbed the lead on a three. Dawson hit a three.29-28. Clay charge, Brian score…31-18. Clay tied it on a 3. They then went up 33-31 after 3. Clay then pulled away 40-33. Parker scored twice…40-37. Dawson’s 2 free throws made it 40-39. Bryson then put the Bobcats back on top 41-40 with about 3 minutes to go! It was 44-43 Clay with 1:13 to go. But the Bulldogs pulled away on 4 free throws to win 48-43.
outstanding game! This is the first time BOTH our teams have advanced to the Sub-State in the same year! While they didn’t win the game, they may have won the better Sub-State game. They played Van Buren who upset CSAS. Many felt that this was a better matchup for the Bobcats. The Bobcats met Monterey at Watertown in the region Semi-finals and came away with a 54-50 win to advance to the Region Championship! lead before a Brian Gibson three put them ahead 12-10. Monterey led 13-12 after one quarter. The Bobcats pulled ahead 17-13 on scores by Brian and Dawson Abbott. Parker Gore’s score made it 19-15 with Brian’s 2 free throws made it 21-15. Monterey came back to tie it at 23 all but a Gibson layup at the buzzer made it 25-23 at the half. Trent Young drove in to score to start the 3rd quarter with Monterey getting their last lead at 28-27 on a three. Bryson Yorke put the Bobcats back ahead with a score and by the end of three it was 35-28.
scored on a reverse layup, and followed that with a three…40-37. Clay Smith scored with Brian hitting another 3…45-37. Monterey hit a three. Bryson scored 47-42. Dawson hit 2 free throws. Monterey walked and scored. Brian made it 50-44. onterey hit a three…50-47. With 13.9 seconds to go Dawson sank 2 free throws…52-47. Monterey hit an NBA three…52-50. They fouled Dawson and he made it 54-50 for the win! Courtney Pritchett, tournament Most Valuable Player, led the 26-2 Lady Bobcats to their 2nd consecutive District 7A Tournament Championship Monday night at Livingston Academy. They played in the 2nd game after Clay County demolished Jackson County 63-33, with a huge crowd of fans from both schools packing the gym and the Pickett County student section, cowboy themed, making themselves heard led by the terrific Pickett County cheerleaders. The Lady Bobcats won the tip off but their 3 pointer was off but their defense caused a Clarkrange turnover. Soon Clarkrange scored on two free throws. Savannah Hammock was fouled and tied the score. A second Clarkrange wild pass gave the Lady Bobcats the ball again and Courtney was fouled…4-2. Each score brought on a roar from the Lady Bobcat faithful! Courtney then stole the ball and Savannah scored and was fouled…7-2. But Clarkrange came right back to take an 8-7 lead. That didn’t last long as Abbi Buck drained a three pointer! A Clarkrange 3 was off and Aaliyah was fouled…12-8. Clarkrange’s Crabtree also was getting into early foul trouble. Clarkrange came back to tie. Then a Lady Buffalo fouled Courtney and as Courtney started to walk by her, the player body-shoved her but nothing was called…much to the dismay of the crowd calling for a technical. Courtney added a free throw and then hit a three pointer to end the quarter 16-12! That shove may have been the incentive the Lady Bobcats needed! Savannah scored first to go up 18-14. Courtney scored…20-14. Clarkrange walked with the ball and Courtney hit another 3 for a 23-14 score and the crowd was roaring again! Next she went to the foul line…25-18. After Aaliyah hit a free throw, Courtney sank her 3rd three of the night…29-20. Both teams missed shots and had turnovers before Aaliyah scored…31-23. Kassidy Geesling then stole the ball but a Lady Bobcat three was off. PC got the ball back and Kassidy was fouled…33-23. After a Clarkrange missed shot, Courtney hit 2 free throws and the Lady Bobcats had their biggest lead at 35-23. Clarkrange hit a 3 and the half ended 35-26. Clarkrange opened the 3rd quarter hitting a three, then scored again…37-31. Courtney then drove in to score. Clarkrange scored, Savannah scored…41-35. When Aaliyah scored it was 43-36. Clarkrange scored, a PC shot was off but Aaliyah stole the ball and was fouled…45-38. Clarkrange got an old fashioned 3, PC missed a 3 with Clarkrange scoring…after 2 Clarkrange walks were not called. PC missed free throws and Clarkrange scored. Another PC shot was off and Clarkrange answered with a three to take the lead at 46-45 and the quarter ended. They then went ahead 48-45 and the Lady Bobcats missed 2 shots before a huge basket by Aaliyah cut it to 48-47. Clarkrange threw the ball out of bounds on a wild pass but a PC shot was off. Courtney then stole the ball, passed off but another PC shot was off. She immediately stole the ball AGAIN and scored 49-48! Clarkrange turnover, Courtney scored…51-48. Clarkrange score and then one of Abbi’s biggest three pointers of the year made it 54-50! With 2:55 to go Clarkrange scored. Aaliyah then drove to the basket and scored over a player a foot taller than her 56-52. Courtney stole the ball and was fouled…58-52. Clarkrange missed the front end of a 1 and 1. Courtney was fouled…60-52. Clarkrange scored. PC turnover and Clarkrange score…60-56. Gracie Martin added a free throw…61-56 and with 11.3 to go Aaliyah was fouled and hit both for the winning 63-56 score! Courtney had 28 points, 6 steals and 10 rebounds as she was named MVP. Also on the All Tournament Team were Kassidy Geesling, Aaliyah Brown, Abbi Buck and Savannah Hammock. While district MVP defensive player Gracie Martin didn’t make the team this time, the Lady Bobcats wouldn’t be where they are this season without her outstanding play all year. They will now play Trousdale County Friday night at home! Pack the gym! The Bobcats also play at home on Saturday night. Scoring: Courtney 28, 3 threes, Aaliyah 15, Kassidy 2, Gracie 1, Savannah 11 and Abbi 6, 2 threes. The Lady Bobcats breezed past Jackson County in the first round of the district tournament on Friday night. The win was the 7th in a row over the Lady Blue Devils with the Lady Bobcats winning by an average score of 70-46. JC scored first with the Lady Bobcats missing a three, but Courtney Pritchett stole the ball and was fouled. Her free throws tied the game. With the score tied at 4 all, MVP Defensive Player of the Year Gracie Martin stole the ball with Savannah Hammock scoring. Abbi was next to score…8-4. It was Kassidy Geesling stealing the ball next with Gracie going coast to coast to score. JC then scored on an old fashioned three but Aaliyah’s three pointer made it 13-7. Another steal and Aaliyah was fouled and sank both…15-7. Courtney then stole the ball and scored and the rout was on! Courtney hit a three and a minute later added a free throw for a 21-11 score at the end of one. Aaliyah’s score made it 25-15 and then she immediately stole the ball. Courtney scored the next 2 baskets, plus added a free throw…30-19. Aaliyah then drove the length of the court for a layup. Courtney added 2 free throws, Aaliyah scored again with Savannah next going the length of the court to score…38-25. Aaliyah had yet another steal. Savannah scored at the buzzer to end the half with the Lady Bobcats ahead 46-30. Savannah scored first on a freethrow for Pickett Co with Courtney then stealing the ball and being fouled. She sank both. Next Abbi stole the ball. With the score 54-30, Gracie had another steal and score with Courtney stealing the ball. She was fouled and sank both…58-31. The quarter ended with Savannah nearly stealing the ball but then Courtney did steal it and was fouled. Her free throws made it 63-33 at the end of 3 quarters. The final quarter scoring began for the Lady Bobcats with Savannah sinking a three pointer. Gracie’s three made it 71-39. At that point the talented younger players came in, along with Aaliyah who stays in since there aren’t enough substitutes for 5 players. She is outstanding in her role of wrapping up a game. Tyra Johnson scored on a free throw with Elly Smith going all the way down the court to score…73-39. She then had a free throw and Aaliyah scored next on a turn around jump shot…76-43. She then took the ball coast to coast to score. The game came to an end with Elly stealing the ball and being fouled. She sank both free throws for a final of 80-45. The win put them into the finals against Clarkrange, who won 68-50 over Clay County in the earlier game. Courtney led all scorers with 23 points with 1 three. Brown 19, 1 three, Geesling 4, Buck 2, Martin 9, 1 three, Hammock 17, 1 three, Smith 5, Johnson 1. The win also gave them a home first round region game. The Bobcats met Jackson County in the district tournament on Saturday night and after leading by as many as 19 points, came away with a 64-53 win to advance to the championship game Tuesday night against state ranked #4 Clay County. The game started with the Bobcats winning the tip off, but turned the ball over. A quick reacting Parker Gore then stole the ball and scored. Brian Gibson was next to score…4-4. JC went ahead on free throws but Dawson then went coast to coast to score. He then stole the ball but his three pointer went in, spun around and came out. JC then scored followed by both teams trading turnovers before Dawson drove in to tie the game at 8 all and added a free throw to go ahead. The Blue Devils scored to take an 11-10 lead at the end of one. The first score for the Bobcats of the 2nd quarter came when Trent Young stole the ball with Brian Gibson feeding Bryson Yorke for the score. The score was soon tied twice at 11-11 and 13-13. Trent’s free throws put the Bobcats on top 15-13 but a Blue Devil three gave them the lead at 18-17. It would be tied one last time at 20-20 before Brian scored for a 22-20 lead. JC scored and made a free throw to give them their last lead at 23-22. Trent scored with Clay Smith stealing the ball and he scored… 26-23. Jackson County then cut it to 1 point before Brian’s 2 scores made it 30-25. JC scored on free throws with Dawson ending the scoring for the half with 2 free throws…32-27. Dawson’s three to begin the 3rd quarter started the Bobcats on their big third quarter. Parker scored next, Brian added a free throw…38-29. Dawson drove to the basket to score…40-31, Brian fed Bryson again for another score 42-31. Brian then stole the ball with Trent hitting a three for a big 45-31 lead. It was then Trent to Bryson for a score and then Dawson hitting a three as the Bobcats completely shut down the Blue Devils. It was now 50-31, which would be the Cats’ biggest lead of the game. The quarter ended with a great steal by Parker. The Bobcats outscored Jackson Co. 18-5 in the quarter. Dawson had one more three in the final quarter to end his scoring for the night with 32 points with 3 threes. Bryson 10, Trent 7, 1 three, Parker 4, Brian 9, Clay 2. The win put the Bobcats into the championship game against Clay County Tuesday night and gave them a first round home game in the region tournament. The coaches have voted the All 7A District teams with many Pickett County players being honored. A few Pickett County players may just prove in the playoffs that they certainly deserved to be placed higher! This post was before the district tournament was played and the All Tournament Teams will also be in this issue. Congratulations to Coach Brent Smith on being Coach of the Year yet again! PLAYER OF THE YEAR-GRACIE MARTIN-PICKETT CO.